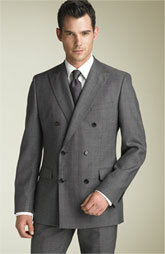 How to choose quality mens suits and the right style for your body. A suit is either something that some guys need to wear everyday, or its something that some guys hardly ever need to wear. Either way, every guy needs at least one good-looking suit. Suit fashion doesn’t change that much, so it makes sense to invest in a high-quality, excellent-fitting suit, because you will be able to wear it for years and years. 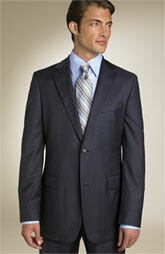 Quality mens suits will last a long time so don't be afraid to spend some money. This mens suit is also known as the “sack suit”. 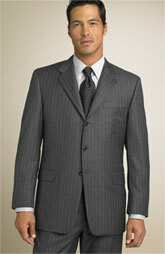 It has two or three buttons, a notched lapel, and the jacket has a center vent. The pants are flat-fronted with a narrow leg, giving the suit overall a slim look. The American cut is known as a casual cut. This one is similar to the American cut, but it has pleated and cuffed pants, and side vents on the jacket. This cut is usually double-breasted with a wider lapel, along with pleated pants. This is best for tall, slim guys. Otherwise when you sit the material on the sides poke out because the suit opens up. Your safest bet is to stick with either an American or British cut suit that fits great on you. It can’t go out of style and you’ll be able to wear it to all your divorce hearings. You should definitely focus on quality. For a really nice, high-quality suit, you’re going to have to pony up $500 or more. Its only a one-time investment though. And a good one. 99% of quality mens suits are made of 100% wool, and yours definitely should be. Wool is a natural fiber that is durable. If you’re always wearing suits, then its okay to look into some other materials like poplin or linen. Those can be cool. The most versatile color a suit can be is navy blue, or a dark grey. You mix up your dress shirts and ties and with one suit you can have a hundred looks. If you only need one suit do not make it a black one. Black suits are severe and only for certain occasions. Blazers are the related to the suit jacket but much more versatile. You can wear a blazer with anything. A good, blue blazer is like a suit, you can wear it forever if you take care of it. For the winter get yourself a tweed blazer. Again, blazers look great with slacks or jeans. For any crazy ideas you get, consult a female first.